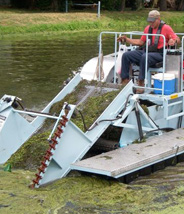 Inland Lake Harvesters are an effective solution to managing your aquatic weed infestation—from battling algae to water lilies. Examples of common problem weeds can be found in our list to the left along with a brief description of each weed. For help with your specific issues, we encourage you to contact our experts directly for a solution that's tailored to suit your needs.